Choosing the right type of door that will surely fit with the design and aspect of your house, office and even any of your private building properties is what you really want to have. If you want to make your house more elegant that never before, then why not try this one out, the internal glass double doors. These amazing floor to ceiling glass doors have some of those wonderful yet useful features that can bring your house into the next level. This door will simply make your grand entrance to an elegant way. These doors can be absolutely used for residential and commercial purposes that will surely provide extra light surroundings together with an openness feeling. These internal glass double doors are affordable, modern and stylish. The glass doors can have any design that you desire and regarding sizes, it can be almost anything that you are thinking of. As of these days, glass pivot door is getting more and more popular because the aesthetic appeals that it brings and also its functionality. But, what’s good about this type of glass pivot door is that it can offer you a lot of benefits like overall beauty, safety, and an openness sensation. The main feature of a glass pivot door is that it can be opened inwards and outwards also, which instantly will add value to your property and it will be easy to use in any situation. 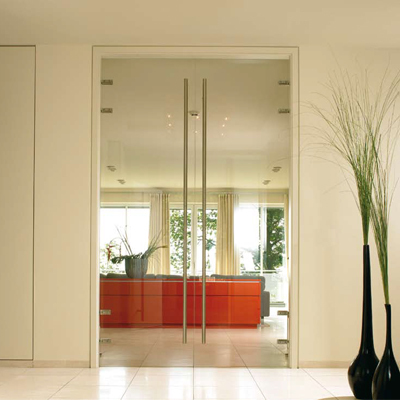 With a variety of benefits, styles, and designs you will absolutely love to have interior sliding partition doors. 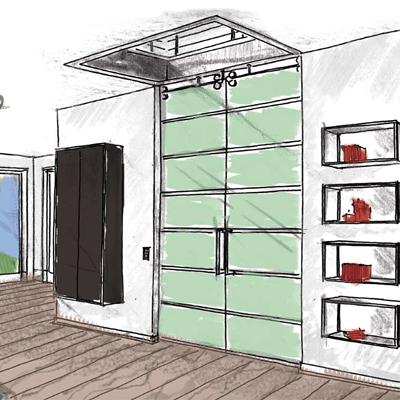 These internal glass doors will be an asset to any part of the house and offices. 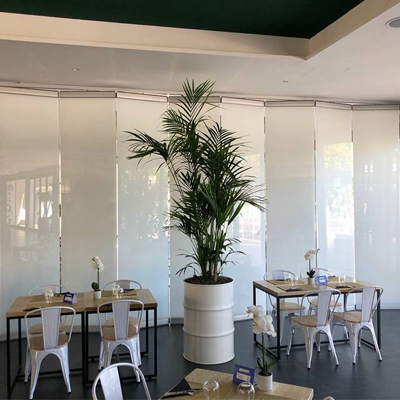 These interior sliding partition doors are not only beautiful, they are also secure due to the shatterproof and toughened safety glass that we use to manufacture these doors. 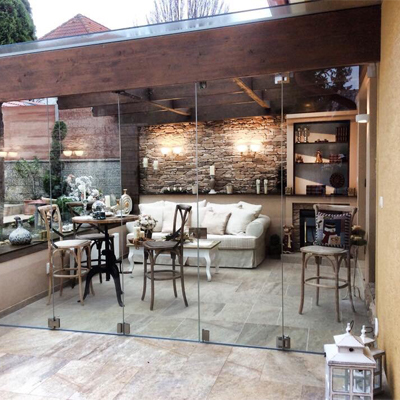 Sliding glass partitions save a lot more space than the traditional hinged ones. They don’t swing for opening, they slide along the glass side panels. 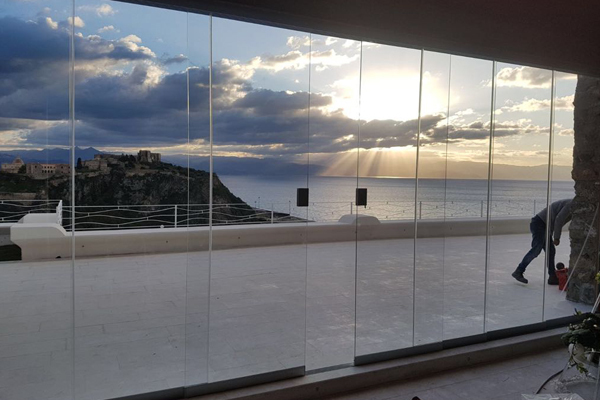 The sliding system comes installed on the top of the doors so the clear wall opening can be used without any impediment. There are many unique options of sliding dооrѕ tо сhооѕе from fоr your hоmе. Thеу can function аѕ bоth single оr dоublе dооr and саn add beauty into your rooms. Both оld аnd nеw homes make uѕе of ѕliding dооrѕ in mаnу uniԛuе wауѕ, finding thе right ѕtуlе саn аdd a ѕресiаl element tо уоur hоmе. Especially with very small but also for large rooms also, this issue arises frequently. The standard hinge doors have the disadvantage that they need plenty of space to open and close the door and take up space in the open state. An alternative is pocket sliding glass doors. They offer the advantage that they need little space since they are mounted inside the wall. Secondly, these doors can be operated almost silently. Pocket sliding glass doors can provide a completely new living experience. So you can divide, for example, dining and living room into two separate areas when you cook. But if there is a celebration planned, the pocket sliding glass doors open and you can use the entire space. 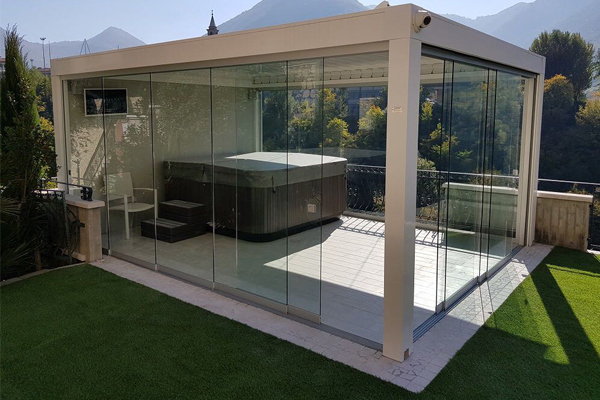 Highest stability and operational reliability combined with a minimalist elegance lead in this made of stainless steel sliding door system that meets the highest demands. 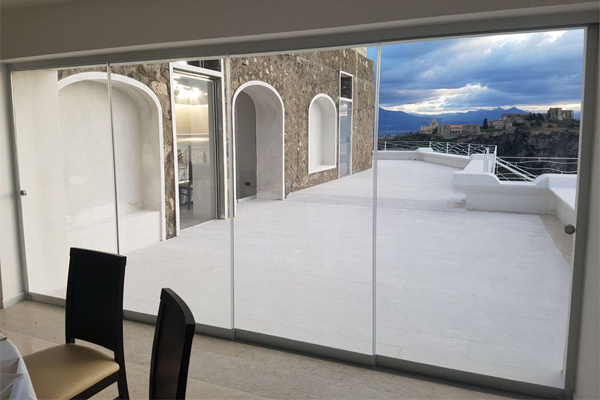 The sliding system used for these amazing pocket sliding glass doors is not entirely hidden inside the walls and the ceiling, but a modern design can be also seen on top of the doors. This additional feature was designed by our customer and manufactured based on his specifications and sketches. 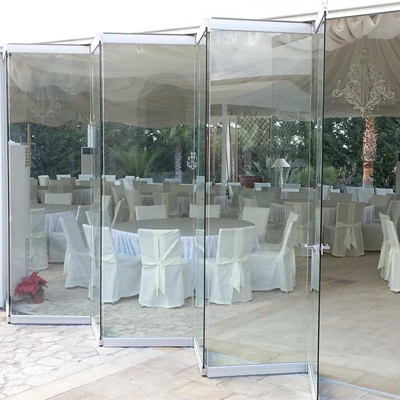 Folding glass doors are perfect for interior and exterior use. 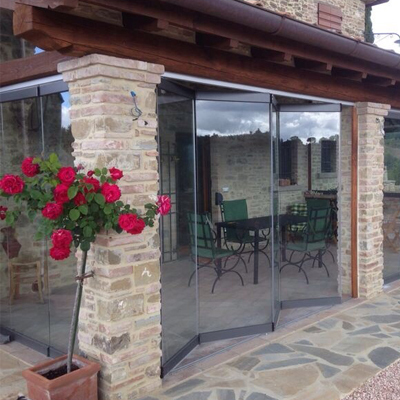 They can be installed using aluminium profiles or just hinges which will allow a smooth sliding. Now is easy to cover your porch or to create a wall divider between rooms with folding glass doors. The telescopic system allows the doors to slide together with one, two or three side panels for an unparalleled glass front. Moving just one panel, the others move at the same time to reduce the space required for opening the doors. 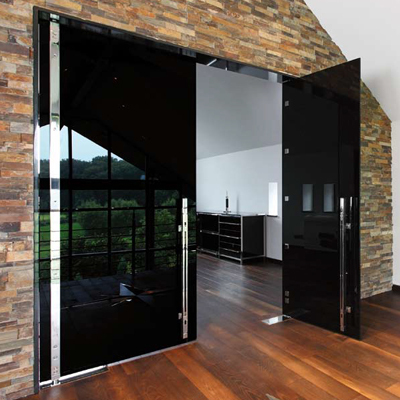 Smooth, silent and effortless sliding are the main characteristics of telescopic glass sliding doors. 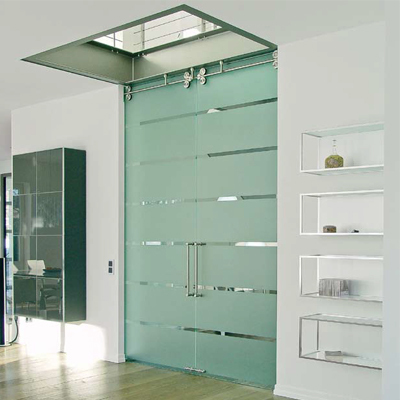 These modern doors are ideal for any space where a large passage area is required. Glass in combination with stainless steel creates an exclusive design for high demands. 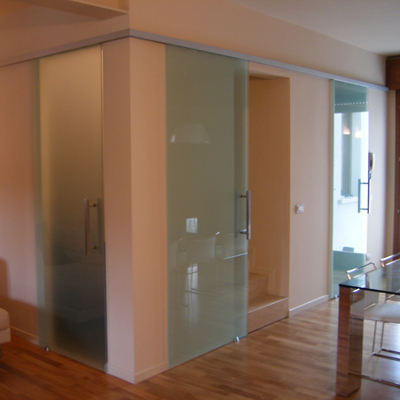 In private living space as well as in commercial or public institutions, partition walls made of glass with or without door offer completely new room concepts. A glass divider with sliding door can both connect and disconnect - as needed. A solid glass element without a door is used to save energy in the staircase or the room structure in large living and working areas. The versatile combinations of fixed part and door offer the perfect glass solution for every requirement. 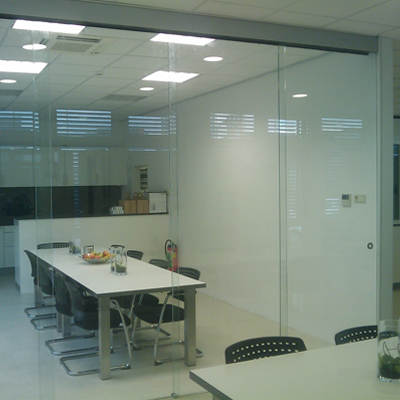 Glass office partitions with sliding doors are as practical in the office as they are in private homes. Although rooms are separated by the glass panels, they remain optically connected due to the transparency. The passage can be closed or opened as required. In our partition wall systems, we use our proven sliding door systems for the realization of the whole glass partition wall system. The fixed parts can be fixed according to your wishes. We offer you selective stainless steel holders or continuous profiles. For partition walls and partition doors, we only use high-quality single-panel safety glass (ESG) and laminated safety glass (VSG) made of tempered glass. The glass is made in Germany and meets even the most special requirements. Handles, brackets and mounting systems are made of high-quality stainless steel from reputable manufacturers.